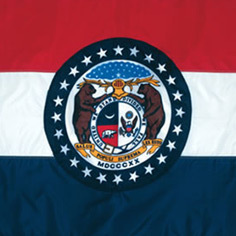 Missouri has always been a bear state. As they return, it’s important to look back on how integral black bears were to Missouri’s natural heritage. In September of 1700, a Jesuit missionary named Gravier, was descending the Mississippi. Near what is now Scott County, he noted, "To-day we saw over 50 bears, and of all that we killed only four in order to obtain some fat. Those that came down the Mississippi were lean, and those that came down from the direction of the Ohio were fat." Bear fat was particularly prized by the early frontiersmen, often rendered into nutritious bear oil for transport and storage. However, that was not all hunters desired. Bear meat was considered a more preferred, pork-like meat and making bear bacon was common. While exploring the Missouri River, the men of the Lewis & Clark expedition had a taste for bear. They killed ten to twelve bears on their passage through the state in 1804. Clark reports that on June 7th, in what is now Howard County, the hunters, "who had hitherto given us only deer brought in this evening three bears." "One old famel and her two cubs" presumably went into the grateful pot. Reports from other parts of the state indicate that bear numbers were equally impressive. 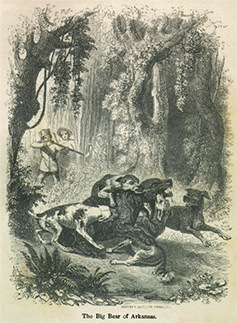 In 1819, Thomas Nuthal wrote that although it is not well populated due to high water, "the wild below the Ohio, on both sides of the Mississippi abound with bear". By the 1830’s large numbers of bear were being taken by hunters in New Madrid County to protect an "injured cattle industry" and it was in these isolated wildlands in Missouri’s Bootheel, that the last known population of black bears were thought to have survived. Townsend Godsey reported that occasional individuals could be found in the Bootheel until the great flood of 1927. Though thriving across the state, it was in the Ozarks, where the bears are now making their remarkable comeback today, that bear numbers were greatest. And they were an essential component of Ozark life. Henry Rowe Schoolcraft traveled through the Ozarks in the winter of 1818. He noted in his journals that bear meat was a staple in the White River country. A hunter named John Shaw was reported to have killed 300 bears near the southwest corner of the state in 1811. He had the skins and 800 gallons of bear oil to prove it. Another settler in the White River country reportedly had over 1000 pounds of bear bacon stored. No animal could survive that kind of hunting pressure; bear populations plummeted statewide. The decline was precipitous and nearly final. 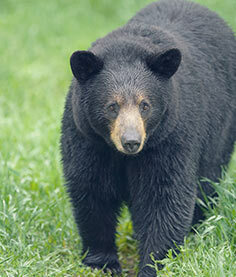 By the 1890’s black bears were considered extinct in the Ozarks. Every few years there would be report of a bear, but they were sporadic, widely spaced and clearly not indicative of a breeding population. Until now. The recent increase in Missouri’s black bear population has been primarily attributed to transient bears from neighboring state’s restocking programs. However, new DNA research suggests that a small population of Missouri’s original bears may have been surviving in the Ozark wilderness all along. It appears that decedents of Missouri’s original bears are surviving and breeding, helping to build their own population back to healthy numbers, one cub at a time. But that story takes us out of history and into the present: the story of the black bear resurgence.